Cleans away bugs and road grime without water. 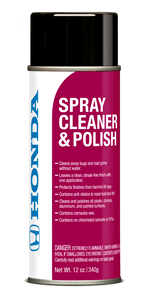 Leaves a clean, streak-free finish with one application. Protects finishes from harmful UV rays. Contains anti-statics to repel dust and dirt. Cleans and polishes All plastic, chrome, aluminum, and painted surfaces. Contains carnauba wax. Contains no chlorinated solvents or CFCs. Honda Parts Direct is a proud member of the Wilson Group, one of the fastest growing automotive groups in the Southwest. Our success has been built by the management and staff’s commitment to our customers, to our employees, and to our community. Our store opened in Scottsdale in 1998 and moved to the present location in 1999, serving thousands of sales and service customers annually. We have earned the prestigious Presidents Award, given by American Honda Motor Corporation, more than any other Honda dealership in the valley. The employment longevity of our staff has contributed to a growing number of repeat customers and high customer satisfaction scores. As a corporate citizen, our store made donations to several local and national charities including Chrysalis Domestic Violence Shelters, Crisis Nursery, Phoenix Children’s Hospital, JCC and Special Olympics, Childhelp, Hopi School and Phoenix Suns Charities. In addition, management and staff participated in the Denim Day Breast Cancer Research program and donated clothing, toys and personal items to St. Luke’s at South Mountain. 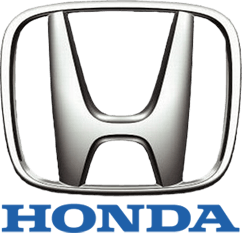 We only carry OEM, Honda replacement parts and accessories unless otherwise presented.